Continuing our loose theme of Not-So-Good Movies by Great Directors, we have 1981’s sequel to the Roger Corman classic Piranha. It’s Piranha Part Two: The Spawning! Or Piranha II: The Spawning. Or The Spawning. Or Piranha 2. Or Piranha II: Flying Killers. “Directed” by James Cameron! In actuality, Cameron was brought in as a patsy and quickly fired so writer and producer Ovidio G. Assonitis could finish the project himself. Anne Kimbrough (Tricia O’Neil) is a scuba instructor and marine biologist drop-out who teaches tourists how to deep dive at Hotel Elysium, a resort on an unnamed Caribbean island that is, for all intents and purposes, Jamaica. Her estranged husband Steve (Aliens’s Lance Henricksen) is on her case about all sorts of things, particularly the mangled corpse of a tourist found during one of her classes. Her breaking into the morgue to examine the body with new beau Tyler (Steve Marachuk) doesn’t help things either. The culprit is a school of homicidal genetically spliced flying piranhas, and everyone must find a way to stop them before the titular “spawning,” and event in which tourists get drunk and beat mating grunion to death on the beach. ProRead: Check out Piranha II's completely overwritten Wikipedia page. Aggressively Semitic would be a great name for an Israeli action movie. Everyone in the '80s would not stop talking about that sweet sunken ship on that unnamed Caribbean island. 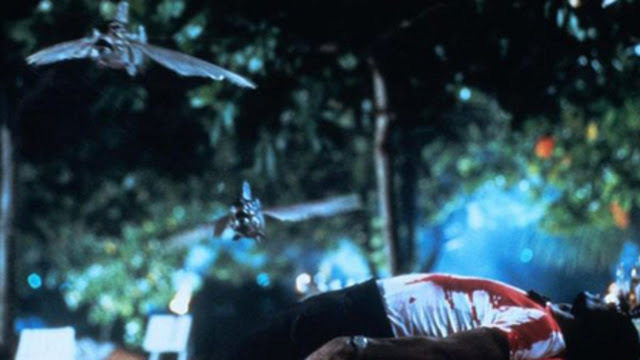 James Cameron has called this "the best flying piranha film ever made." Your Stupid Minds is now on Stitcher! So if you use Stitcher, you could, you know, listen to us that way too.